Three golden snow-capped 4000-meter killer rocks constitute a perfect mecca for mountain climbers and snow lovers alike. 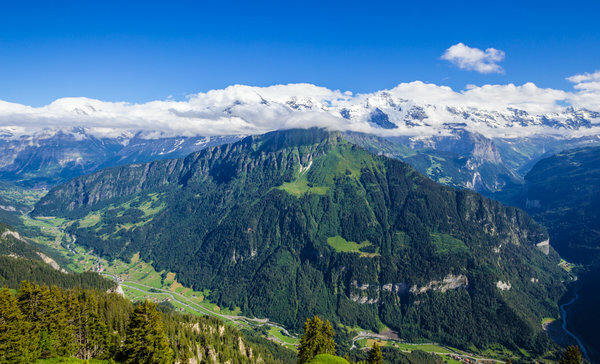 Once you disembark in fairy-tale valleys of Lauterbrunnen and Grindelwald, you can behold the so-called Alpine Trinity or Trilogy: Jungfrau, Mönch and Eiger. The mighty limestone mountain wall towers over the valleys by a height of up to 3 km and stretches over 5.6 km if we count by the distance between Eiger (3,970m) and Jungfrau (4,158m) peaks, with Mönch (4, 107m) snuggly tucked almost in the middle, just 3.5 km from Jungfrau. The wall is extended to the east by Fiescherwand and to the west by the Lauterbrunnen Wall. If you want to experience the true scale of the difference in altitude between the deep valley of Lauterbrunnen (800 m) and the summits, go to the area of Mürren. The area can please the most fastidious traveller: the vertiginous precipices of the north-west and the European biggest glaciated area in the southeast are the trademarks of the region. It has the unrivalled mountain railway and the Sphinx observatory that is the best viewing platform to marvel over the sparkling Aletsch Glacier and the mountains surrounding it. The summit triumvirate Eiger, Mönch and Jungfrau infuses a spell on everybody who comes eye to eye with these huge rocks. You see glaciers and frozen lakes and snow cascading down the ridged slopes. You don’t even think about the uplift and compression. All you realize is that they are stupendous. The colours of these beasts change dramatically. In the daytime and at night, you would never see two identical pictures. Moreover, there is no single common theory as to the origins of the names. The 4158m high Jungfrau supposedly got its name from a "maiden" or "virgin", but it is not so unequivocal. The name of Mönch appeared on the maps in 1860, before that the mountain had not had its own name, being called Inner Eiger, Klein (Little) Eiger (even though it is higher than the latter!) or Grossmönch, or even Eigers Schneeberg. Probably the most mysterious is Eiger. The most common interpretation of the name is Ogre, next explanation is vernacular Hej-Gêr, meaning “high peak”, one more reference is made to the Latin word ‘acer’, meaning ‘”sharp or pointed”, or Swiss German word ‘Ger’ meaning a “javelin”. In any case, not to be lost among the names and peaks, use the PeakVisor app to never experience that dismal disappointment when you see a beautiful peak and cannot say what it is. The app saves a lot of trouble, it gives you graphic and concise information on the mountains and useful titbits of what to do there. The Alpine trinity can be reached from Kleine Scheidegg by the Jungfrau Railway. The journey from Kleine Scheidegg to Jungfraujoch takes approximately 50 minutes including the stops, whereas the downhill return journey takes only 35 minutes. The Jungfrau Railway stops twice on the way up the tunnel. Once at the Eigerwand (2685m / 8,809 ft.), and then at the Eismeer (3010m / 9,875 ft.). Visitors can disembark to get a glimpse through picture windows onto a landscape of eternal ice and snow. Just remember to hop on the train back before midnight, otherwise you will be a poor Cinderella with no transport and accommodation (in high season all the places are usually full). Beware that the trip up to the Top of Europe - the Jungfraujoch - is not included in any Swiss Travel Pass! If you use up a Swiss Travel Pass day, the trip to Wengen and/or Grindelwald is included, but from there you will need to purchase a connecting ticket, either from Grindelwald or Wengen via Kleine Scheidegg to Jungfraujoch and back. This is a round-trip ticket with which you can get to know both villages. For non-pass holders the "Good Morning" or "Good Afternoon" ticket could be an option between May 1 and October 31. This means you profit from a lower ticket price if you visit Jungfrau either in the morning or in the afternoon. Please, do pay attention to the fine print on their website. Both tickets are only valid on certain trains! Other Options: Should you spend your holiday only in the Jungfrau Region, do check out the Regional Bernese Oberland Pass - valid between May and October - (Swiss Travel Pass holders receive a discount) or one of the Jungfrau Passes. Admission to the Sphinx (viewing platform), the Ice Palace and "Alpine Sensation" are included in all tickets. All tickets can be purchased at any train station in Switzerland on the day you visit the Jungfraujoch. You can purchase tickets online in advance, but I don't recommend doing that. Keep an eye on the weather forecast and only go to the Top of Europe when the weather is good or you could get disappointed. Tickets are not exactly cheap, and when the peaks are shrouded in clouds, are rained or snowed upon, you wouldn't see much, so have an alternative plan ready. By the way, the PeakVisor app works even in bad weather! It is eerie to see the outlines of the mountains on a foggy dimly grey screen when the weather defies good vision. Eiger is a mecca for rock climbers who must have considerable bravado to even attempt this. The Mordwand (the North Wall) of Eiger was the last to succumb to the aspirations of the die-hard mountain climbers, taking the lives of eight climbers before the first successful climb by Heinrich Harrer in 1938. “If that rock face can be climbed, then we are going to do it – or die doing it” were the immortal words of Edi Rainer and Willy Angerer in 1936 about the north face of Eiger. Unfortunately, they did not conquer the face and died in their attempt. The earliest to yield was Jungfrau. The Virgin (or the Maiden) had no chances to fight the charms of Johann and Hieronymus Meyer the sons of a rich merchant Johann Rudolf Meyer, and two chamois hunters Alois Volker and Joseph Bortis. They climbed it on August 03, 1811. Their two brothers, Rudolf and Gottlieb Meyer, had to repeat the heroic deed a year later, as there were many people who did not believe the Virgin had finally given in to the climbers. The famous Christian Almer accompanied by Ulrich & Christian Kaufmann, and Dr. Siegmund Porges on August 15, 1857 climbed Mönch. And Eiger was first climbed by the western flank a year later – on August 11, 1858 by Charles Barrington together with two Swiss guides Christian Almer and Peter Bohren (who let him be the first on the mountain). Christian Almer (1826 – 1898) was a Swiss mountain guide and the first ascensionist of many prominent mountains in the western Alps during the golden and silver ages of alpinism. He is the man who was the first on Mönch, Eiger, Gross Fiescherhorn, Barre des Ecrins, Aiguille Verte, Grand Cornier, Pointe Whymper (Mont Blanc Massive), Nesthorn, Lkeines Schrechhorn, Mont Thuria and many more. He accompanied Miss Meta Brevoot in her climbs and gave his dog Tschingel to the 17-year-old W.A.B. Coolidge after a failed attempt on Eiger. There is another Christian Almer waiting for you in the Mönchsjoch hut (Mönchsjochhütte), he is the hut warden and highly likely the descendant of the great man. If you are still not sure in your powers or lack the time to climb all the three summits, take a double: Jungfrau and Mönch make an excellent all around introduction to the art and skill of alpine climbing. Both offer real climbing, though never exceedingly difficult (PD or AD+ would be the highest levels of difficulty), and are conveniently located near the same base. 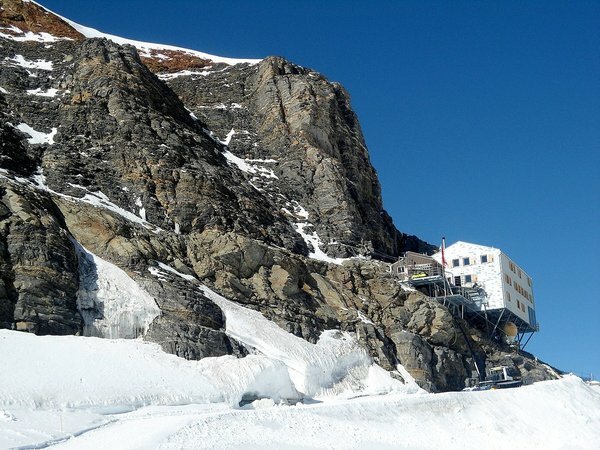 Both are climbed from the Mönchsjoch Hut, the highest mountain serviced hut situated at 3,650 m. The hut operates mid-May to mid-October and can be reached in about 45 minutes from the train station at the Jungfraujoch (the Sphinx Station). As with most European huts, there is no need to bring any camping or cooking gear. Bunks with bedding and a three-course meal, as well as breakfast, are provided. Now that is mountain living! Mönch is a shorter climb than the Jungfrau and is a good first choice. The normal route ascends the southeast ridge. The climb is straightforward and is easily approached in about ten minutes walk from the hut. After the short, initial snow slopes, the scrambling begins. Most of the rock is easily negotiated, but a few sections require a bit more prudence. Still, the climb is adequately suited for those with little rock climbing experience. After the rock comes the final snow ridge which is very easy, but longer than it appears. The summit is reached in about two to three hours after leaving the hut. From here, you can enjoy the marvellous views of the neighboring peaks including the Eiger and the Jungfrau. It is an excellent introduction to a variety of alpine climbing techniques and a very worthwhile summit. To admire it afterwards from below, reflected in the waters of the distant Thunsee Lake, is a truly rewarding experience. The second day is usually devoted to Jungfrau. You head back towards the Sphinx Station, cross the glacier to the base of a rocky spur at the foot of the mountain, climb up the rocky terrain and encounter a short section of moderate scrambling. The ridge eventually steepens to about 35º with a small saddle, the Rottasattel, below the upper southeast ridge of the mountain. As you gain the ridge, the angle steepens and, depending on snow conditions, you may begin to climb with belayed pitches to the top. This last bit is some of the most spectacular climbing and scenery on the route, with amazing views down to the valleys below. The angle never exceeds 45º. The summit is quite small and offers a fantastic mountain panorama from Mont Blanc to the Matterhorn and many of the mountains of Eastern Switzerland. 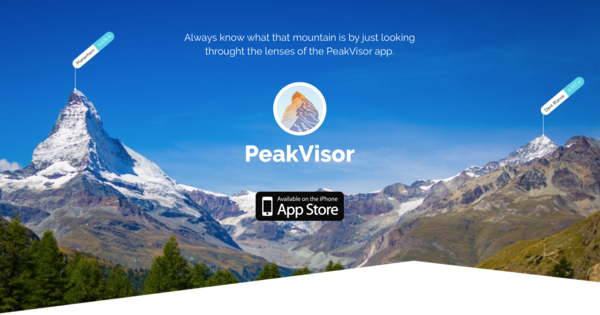 If you cannot decipher all other mountains you behold – take the PeakVisor app and get all the info you need. The ascent should take four to five hours from the hut. Any difficult sections encountered on the way up are easily bypassed by rappelling from any of the numerous fixed anchor points along the way. Take the Jungfrau railway to the Jungfraujoch. A short walk to the Mönchsjochhütte, and ascent of the Mönch (4107 m) from the southeast, on a ridge of moderate rock and snow climbing. Return to the Mönchsjochütte for the night. Traverse the Jungfraufirn to the Jungfrau (4158 m), ascend via the Rottalsattel, a mostly snow and ice climb with some short rock climbing sections. Return to the Jungfraujoch station and descend via railway to the Kleine Scheidegg for the night. Re-ascend via railway to the Eismeer station, emerge from the tunnel onto the Challifirn glacier, and traverse it a short distance to the rocks which lead up to the hut. 4 pitches of technical climbing lead to 3rd class scrambling, and the Mittellegi hut. Climb the Mittellegi Ridge to the summit of the Eiger (3970m), descend via the south ridge back to the Mönchsjochhütte, or via the west flank, to Kleine Scheidegg. Descend to Kleine Scheidegg or Grindelwald for the night. There are three big huts that help you to survive in this part of the Bernese Alps. The Mönchsjoch Hut (3,650m a.s.l.) is situated in the middle of the Jungfrau-Aletsch UNESCO World Heritage. It allows you to embrace the 4000m Jungfrau, Mönch and the Fiescherhörner, as well as a good part of the Valais Alps. The Walcherhorn and the Gross Fiescherhorn are also good climbs that can be readily done from the Mönchsjoch hut. The Guggi Hut (2, 791m a.s.l.) is situated on the north-west ridge of Mönch. If you know where to look, and with the PeakVisor app you will always be in the know, you can see the hut from the railway station Kleine Scheidegg at 2061m. The hut is open all year around. During the weekends from mid-June to end of September the hut is normally served by a warden. The Konkordia Hut (2, 850m a.s.l) is a starting place of over 25 routes. It is located in a fantastic place, where three firns (Ewigschneefäld, Jungfraufirn and Grösser Aletschfirn) converge into the Aletsch Glacier (aka the Great Aletsch Glacier). From the porch of the hut, you can get great views over many mountains: Jungfrau, Fiescherhorn, Gross Grünhorn and Aletschorn to name a few. A route to Mönch summit will take 6-7 hours in summer and 7 hours in winter. Jungfrau is one hour closer; Trugberg and Kranzberg are merely 3-4 hours away. Climbing is not the only lure of the three mountains. You can have fantastic skiing in the Jungfrau region, go snow tubing, biking, hiking or running the famous Eiger Trail. If that is too low on adrenaline for you, try paragliding. It will make your heart beat fast, but don’t expect too many offers available as it is an extreme deal. You can take PeakVisor app to locate yourself and the mountains that you’ll be flying over. Anyway, the Alpine Trinity has a lot to offer to the kids, adults and tired retirees alike. Routes Tips is available as a free app from the App Store or Google Play. Copyright © 2015 Routes Software S.R.L.